BMW performance parts - Take your Bimmer to the edge with quality BMW parts designed to boost performance and enhance efficiency. Each of their performance parts has been engineered to work with your BMW model for maximum results. Quality BMW replacement parts - When you won't trust your BMW to anyone else -- make repairs or take charge of the restoration when you shop for genuine BMW parts online or in their extensive catalog. They've gathered the finest OEM and aftermarket BMW parts for each year and model, so you'll get the right parts every time. Exciting BMW accessories - Whether you want to add an awesome new sound system, a set of fog lights or just protect the carpet with a new set of floor mats, the Bavarian Autosport catalog has the OEM and BMW after market accessories you want for your car or SUV. Genuine BMW interior parts and exterior parts - From upgrading newer Bimmers to making repairs on your classic BMW, you can trust them to have the interior and exterior parts your BMW needs. Restore a classic with replacement body panels, or customize a late model car or SUV with new wheels, lights, fenders or trim kits. Whatever your BMW needs, you'll find it in their huge catalog or online shopping site. BMW aftermarket parts - If the OEM parts you need aren't available, Bavarian Autosport also features a complete selection of aftermarket car parts designed to work with your BMW vehicle. Mini Cooper accessories and parts - BMW Mini Cooper drivers haven't been left out. Bavarian Autosport also carries a full line of Mini Cooper parts, upgrades, and accessories. BMW logo gifts - Treat yourself or the Bimmer fan in your life to BMW logo gifts. Browse the website for everything from key rings and caps to valve stems and license plate frames. 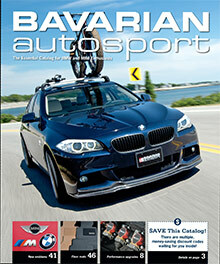 For all your BMW accessories and parts needs, you can count on the BMW pros at Bavarian Autosport.